From time to time, you create new pages, modify existing ones and move some others. You might even decide to change your complete website some day. When you do so, the links that Google and other search engines have recorded might change. For example, a link such as "www.example.com/mylink" may one day not exist anymore. The content of this page might be deleted or simply moved to another location such as "www.example.com/yourlink". How to tell search engines and visitors that your page has moved? Whenever you move a page, the old address becomes invalid. Depending on your settings, the visitor might experience different things. If you haven't set any rule, le visitor will most certainly hit a standard 404 page. The problem with 404 pages is that they give no information whatsoever on why the page is unavailable or where to find the new one. The second possibility is that you have set an automatic redirection: whenever the requested page doesn't exist, your server will redirect the user to another page - a customized 404 page for example. That solution is better than solution one, as at least the visitor knows he is on the website and can browse it. However, search engines and other websites linking to this page have not been informed of the change. As a result, they will continue sending traffic regardless the content of the page. The third solution is simple: you have clearly set a redirection. Your visitors might not even notice the page has moved as they will be instantly sent to the new one. Even better: depending on the redirection settings, search engines might be informed of your new page location, memorize it and update their own database so that no more traffic would be sent to the old link. What do people call the "SEO Juice"? The SEO Juice refers to an invisible stream of power that goes from one page to another. The more strength a page has, the more juice it passes to pages it links to. Let's look at things with a different perspective. Microsoft has an international website with a huge traffic. From a PageRank perspective (if you want to learn more about PageRank, please read "the differences between PageRank and AlexaRanks: which one should I monitor? "), Microsoft's website is very strong. Any link from Microsoft website to any other website would pass part of that power, that "juice" to the other page. Now, if I can make sure important websites link to my page, I will increase the power of my platform by receiving more juice. The more strong websites the better. How do we apply this simple concept to our redirection problem? Which redirection should I set? 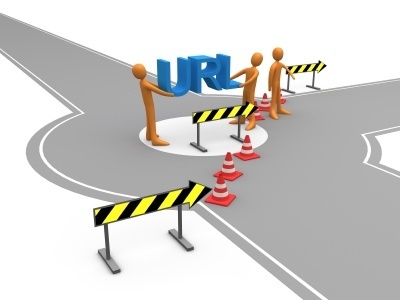 When you call an URL, your browser will contact the corresponding server. This server will then return a specific code to indicate whether the content is available. If it receives a code 200, the page is loaded. That is the standard code that you expect. But there are other codes that can pop up. The most famous one is "404: Not found" and indicates that the server had no content at the requested address. There are many other codes with different functions but I would like to focus on two of them only: 301 and 302. Should I use a 301 or a 302 redirection? Whether you use 301 or 302, your visitor will be redirected the exact same way and will certainly not see the difference. 302 is a temporary redirection. 301 is a permanent redirection. The visitor will experience the same thing but search engines will understand the message differently. 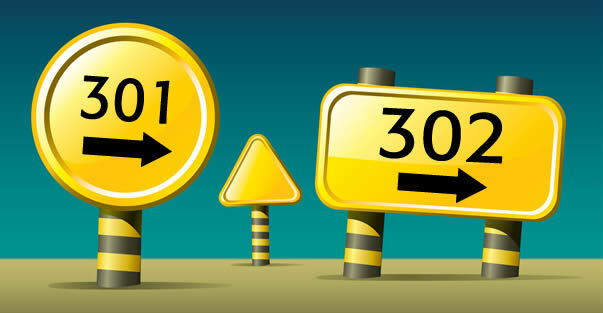 When you set a 302 redirection, you indicate search engines that the visitor must be redirected, but only temporarily. Consequently, next time someone finds your page on Google the search engine will send your visitor to the same old page again. If you set your redirection as 301 you tell Google that your page has move definitely. What is the difference in terms of SEO juice? Except if you really moved your page for a short period of time only, always set your redirection to 301. That way, search engines will remember the change and send the next visitor directly to the right page. Moreover, the juice coming from other websites links will be passed to the new page instead of being lost on a non-existing page. If you wish to continue improving your site you might want to read all you need to know about SEO. If you are currently launching a new website, I invite you to read problems and mistakes to avoid when launching a new website.